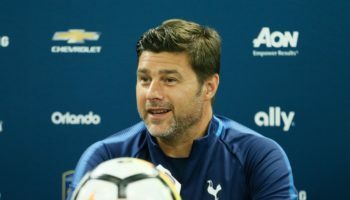 When both David Villa and Sebastian Giovinco halted their domestic European careers to start anew in the United States, the expectations that goals were going to pour from their boots were to be expected, even if reality would suggest that might not necessarily be the case to start. Therefore, we should be savoring what just happened at The House That Ruth Built on Sunday afternoon. Villa’s third two-goal game in the last four outings was almost overshadowed by Giovinco’s first-half hat trick as NYCFC and Toronto FC battled to thrilling a 4-all draw, the highest-scoring game in the young history of NYCFC. That eight goals were scored in the contest is all the more surprising given the fact that the match didn’t have one shot on goal for the first 15 minutes, with the first being a missed opportunity from Villa from 12 yards out, pulling a left-footed shot inches wide of the right upright. Villa capitalized a couple of minutes later on a free kick, getting a deflection of the Toronto wall to score his ninth goal of the season as Toronto goalkeeper Chris Konopka could only redirect the kick off the left post and into the back of the net. The light blue-clad fans had only finished chanting Villa’s name in unison to go along with the public address announcer when Giovinco was pulled back in the box by midfielder Mehdi Ballouchy to offer TFC a chance at an equalizer. Goalkeeper Josh Saunders was beaten, but was saved by his right upright as Giovinco squandered the chance to square the match. It proved even more costly to the Canadians when NYCFC midfielder Tommy McNamara was barged into in the box by defender Damien Perquis, giving Villa chance to double the lead from 12 yards out. Villa went low to his right but was stopped by Konopka, who could only get it as far as an on-charging Mullins who followed the miss. To cap off Perquis’ minute of misery, Mullins sent in a low drive that deflected off Perquis and into Toronto’s net for an own goal and a 2-0 NYC lead. 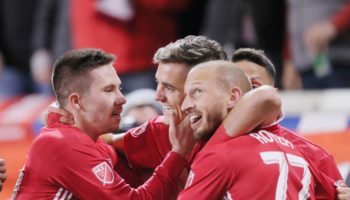 Instead of wallowing in his missed opportunity and his team’s growing deficit, Giovinco took the game into his own hands, scoring a 10-minute hat trick at the end of the half. It started with another penalty, with defender Kwame Watson-Siriboe the guilty party, colliding with Giovinco on the left edge of the box as the ball was rolling towards the end line. Picking the same corner as before, the Italian beat Saunders and managed to keep the ball just inside of his left goal post to halve NYCFC’s lead in the 34th minute. Six minutes later, Giovinco combined with midfielder Jackson, who back heeled a pass to a streaking Giovinco in setting up Giovinco’s right-footed blast past Saunders to tie the score. To finish the one-man onslaught, fellow forward Robbie Findley delivered a fine cross from the right that Giovinco deposited for a 3-2 lead in the 43rd minute. 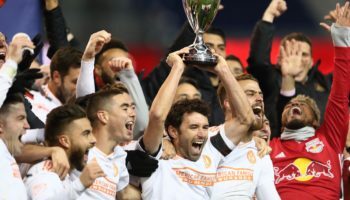 Referee Ted Unkel called his fourth penalty of the contest in the 64th minute, awarding NYC the spot kick after Villa was taken down by a sliding Toronto challenge. Villa made no mistake in burying his second goal of the match and his 10th goal of the season. Villa now has scored seven of his 10 goals this season against teams from Canada, and has scored a goal in each of the four games NYCFC has played against a Canadian-based MLS team. Fellow Spaniard Andoni Iraola made his NYCFC debut at right back, and although he made some good runs from his wingback role, he was responsible for starting the break that led to Toronto regaining the lead late. 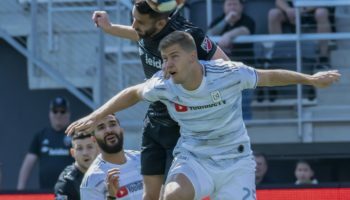 Hounded by Giovinco in his own half, Iraola lost possession when his pass attempt hit Giovinco, who then ran down the left and looked for someone to cross to. Midfielder Marky Delgado was Johnny-on-the-spot as he redirected the cross along the grass and into the back of the net with only eight minutes of regulation time left. 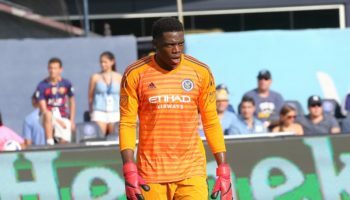 NYCFC, who have now gotten a result in six of its last seven, fought back again, and a mistake by Toronto’s defense helped to gift the New Yorkers a draw. Substitute defender Warren Creavalle, when trying to clear an NYCFC free kick that looked to be headed over the goal line, shanked his attempt right to Mullins in the box, who headed in his fourth of the year six minutes from time to share the honors. Iraola made his debut for NYCFC, but this also was supposed to be the debut of former Chelsea FC legend Frank Lampard. Though jerseys of his – whether in Chelsea blue or NYCFC blue – were prevalent with the fans who made their way to Yankee Stadium, Lampard suffered a calf strain late in the week and was held out of today’s contest.